Cooling Components hold large stocks of Radiators, Oil Coolers and Intercoolers to meet the needs to the UK vehicle parc, with over 8,000 applications listed. All European, Japanese and Asian Pacific passenger cars are catered for, together with light and heavy commercial vehicles, agricultural and off-highway vehicles and plant. All products are sourced globally from world-class manufacturers, with quality issues accorded the highest priority. Service Exchange schemes are additionally available for OES supply. 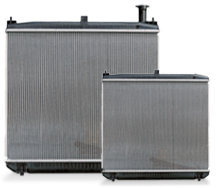 The wide range of Radiators can be supplied either in copper and brass or aluminium and plastic, dependent on vehicle type and customer requirements. Oil Coolers are available for today’s high performance cars, in addition to classic and competition vehicles. Alternatively, they can be designed and produced to specific customer requirements. A comprehensive range of Intercoolers for the latest commercial vehicles is also available.